Calling all Aspiring Young Chefs! We are excited to launch a new kids cooking class series that focuses on food and our five senses: smell, taste, touch, hearing, and vision. How the layering of these senses creates our overall experience with food. Your kids will learn to look at food from a different perspective exploring with their senses along the way, as they create wonderful wholesome recipes from scratch. Do your kids love to cook or want to learn more and gain confidence in the kitchen? 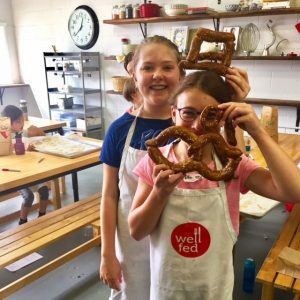 Well Fed’s goal is to get kids cooking from scratch, which we feel is an essential life skill. At our studio we teach hands on technical skills in the kitchen from qualified instructors in a safe and fun environment. We hope to develop/encourage a life long joy of cooking and experimentation with food. Our philosophy at Well Fed is to create meals and recipes that are healthy, well-balanced using whole foods. Learn more about us.